There is a march! A demonstration as they say in England, a manifestation in French. The Arabic is مسيرة. What is it? It is a means to put our bodies in space, where they are not intended to be and to make a claim. It moves, it demonstrates, it shows: it is militant research. It had recently seemed almost like a relic of past time, something that people used to do long ago. Since the powerful demonstrations in Algeria, Tunisia, Egypt and elsewhere sparked the Arab Spring of 2011, leading to the downfall of long-term dictatorships in Egypt and Tunisia, the march seems like a crucial event once more. It is movement through space, a reclamation of space and a place where people and ideas meet. It allows us to be other than the objects of global capital. This project uses the metaphor of the march to tell a story about revolution and decolonization in Algeria from the outbreak of the revolution in 1954 to the year of writing 2011. These are the moments when it is possible to stage the people (click for abstract). This a march in, or in support of, Algeria, whether as a formerly colonized nation seeking independence, or as a metonym for those processes. It asks: how can we "see" Algeria, its decolonization and revolution? Following the lead of Frantz Fanon, it takes the point of view of the child, meaning both children as such, the colonized "child" of the parent nation, and the "infant" revolution that emerged. The Zapatistas say that everything they do is "walking," a journey that has no final destination. This walking is done here by means of text, media and to-camera videos. This format, allowing as it does for a set of intersecting and interfacing threads to compose the whole, is better suited to reclaiming and exploring these histories than the linear text-based narrative. So it is both a story about Algeria as such and a way to understand the interface of decolonization and globalization. Whether or not you work "on" or about Algeria, there is an "Algeria" in your work, meaning that there is a place where the incomplete or failed processes of decolonization and the formation of independent developing-world nations intersect with the power of financial globalization. We need to occupy that place, not erase it. Discussion of "Join the march!" Nick: Your stunning introduction makes me aware of the differences and similarities between intellectual and bodily marches, between reading alone on a laptop and demonstrating with others on a street. A great deal of our work as committed intellectuals is, I think, to make these links (between theory and politics and experience) while humbly realizing one is no substitute for the other. I think you capture a spirit in your writing and design here, on this page, that does this with both excitement and much-deserved resignation. Alex, this is a very generous but also thought-provoking comment. This project was where I moved towards the militant research that we're now engaged in. The time it took was coming to the awareness you mention here of what intellectual work alone does not do and what else is required to make change. Version 77 id 27838 of this page, updated 04 April 2012 by Nicholas Mirzoeff. Created by Nicholas Mirzoeff. 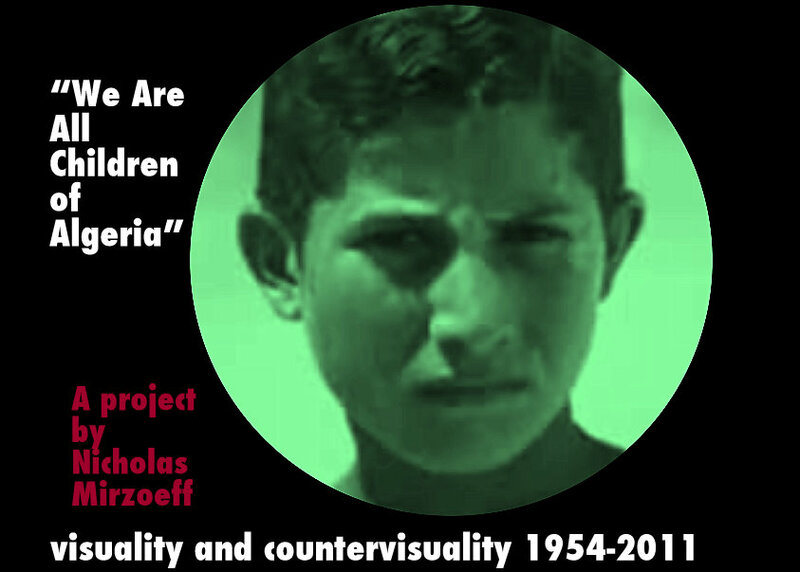 “We Are All Children of Algeria” by Nicholas Mirzoeff. Help reading this book. Published by Nicholas Mirzoeff + Duke University Press. Powered by Scalar.